WirelessGet is now FREE, no more registration or purchase necessary. We are hoping for our users support by using our advertisers goods and services onsite or through banners if there are any here on the software, hence recouping the cost that way. There is no spyware, viruses or malicious adware in our software and is safe and easy to use. Registration for this version is not required, the software comes with a user unlocked version. WirelessGet Wireless File Sharing allows you to copy and transfer shared files and folders quickly over networks such as Wi-Fi / Wireless LAN a.k.a WLAN. Those networks can be unreliable due to signal loss and bandwidth restriction by ISPs etc. 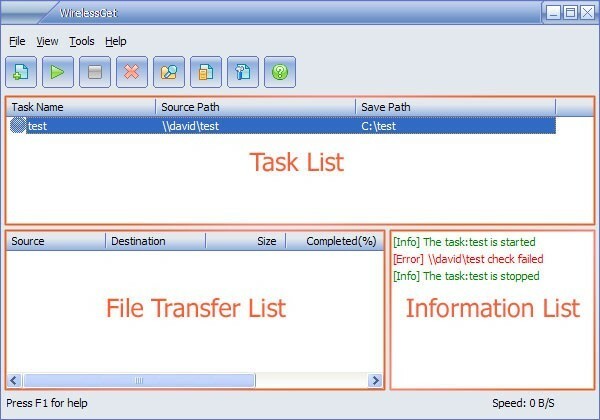 It solves the problem of copying or transferring files using Windows Explorer which often fails due to the size of the file and instability of the network. It also works great for copy files and folders from one location to another on the local drives, or removable drives such as USB, CD-R(W)/DVD. There are no restrictions on the size of files moved or transferred as long as you have enough disk space. Please visit wirelessget.com for more help and support and check for the latest versions, forums and more. * Copy files and folders with Resume capability. * Use write cache to protect your hard disk driver. Qweas is providing links to WirelessGet Wireless File Sharing 1.3 as a courtesy, and makes no representations regarding WirelessGet Wireless File Sharing or any other applications or any information related thereto. Any questions, complaints or claims regarding this application WirelessGet Wireless File Sharing 1.3 must be directed to the appropriate software vendor. You may click the publisher link of WirelessGet Wireless File Sharing on the top of this page to get more details about the vendor.